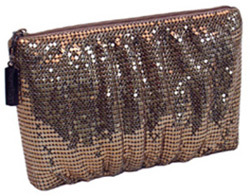 Shirred for extra sparkle, this shiny brass mesh pouch clutch is stylish and very versatile. Carry it day to evening as a glamorous clutch handbag. Also useful as a cosmetic case for keeping makeup safe or as a travel case for organizing in style.